There is something strange, yet magical about the world when you awake in the middle of the night. Far from silent, the sounds seem amplified and enormous in the otherwise still space. Cars pass headed to who knows where. A train rumbles by. The house softly groans. I feel the same way. My rested brain is more intent on interacting and yet the rest of the world is rightly reluctant. My mind drifts to dream of all of the people in all of the places with something to do other than to simply lie here. Still. The world seems to want to keep the action far away and out of reach and yet remind me that it is always there. The sound of others sleeping is a funny sort of comfort. A reminder that rest does exist. Frustration and reassurance come with each steady breath. And yet, I have come to almost enjoy this space. I am free from obligation. I can breathe. I can exist and simply be. I am typing this as I attempt to get my daughter to take a nap. I am failing. I can hear her over the monitor chatting away and just know that she is not going to sleep. I love her dearly and nothing in the world makes me as happy as watching her play. But I adore nap time! I am typing this in between carrying her back to bed as she gets up and attempts one of her many clever diversionary tactics. I have fallen for them all before. I admire her ingenuity. I know that in a minute I will crack and resort to one of my tried and tested approaches. The monotoned storytelling. The head stroke. The ssshhhh to fade. And, when all else fails, I will simply climb in beside her. It may or may not work. And this is not a place for me to offer my mothering tips (see above. I have nothing else!) or a place for me to judge anyone else’s parenting approaches (although, if you know me, I am sure that at some point you have had to listen to me expressing my opinions on various methods). This is simply me killing time in an attempt to stay sane. I look back fondly on the time just after she learnt to self soothe and nap time was simply a case of watching for the signs and laying her down. I could set my watch by her. Household chores crammed in to 40 minutes. I recall those first few months and my obsession with routine. 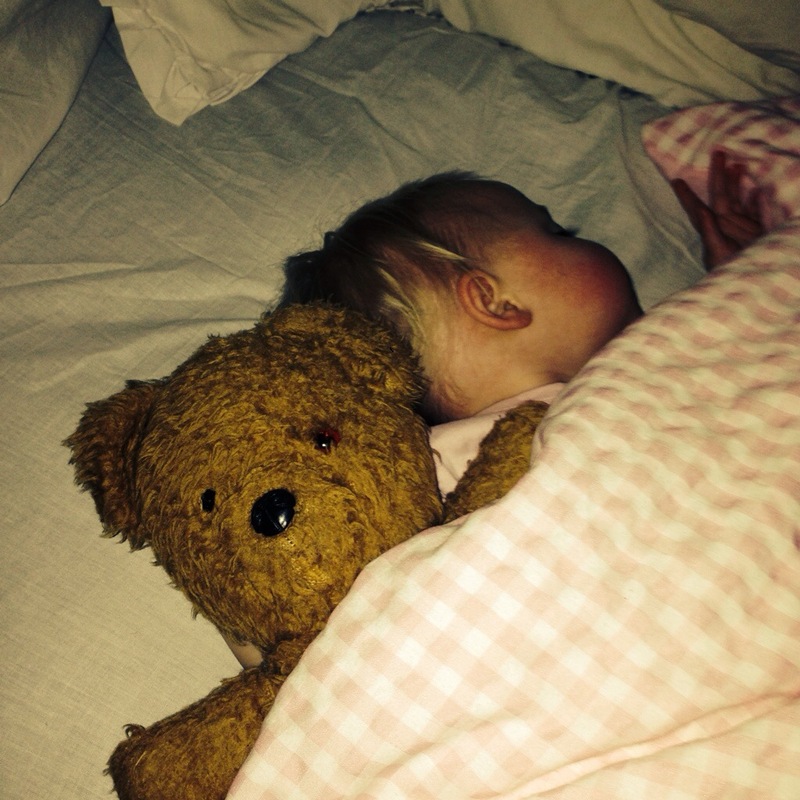 The time and effort I invested in ensuring she got enough sleep and fell asleep in the way I wanted. Patting and swaying to the radio four times a day. And then I remember the early days when coffee with friends was easy. The carry cot nestled by the side of a table in the sun. Twitching purple eyelids and rosebud lips. I realise now that the chatter has stopped. She is sleeping. But I know I will creep upstairs just to check. Just to see her. Because I realise now that nap time won’t last forever. Waking up in the wrong bed is always weird. There are those few seconds where you blink open your eyes and, somewhere between sleep and reality, you have to find your way. You feel strange sheets. You are aware of the light. You listen to unfamiliar noises and wait for your consciousness to catch up with you. And it feels difficult. Because there is something important about a bed. It’s a place for vulnerability and rejuvenation and intimacy and privacy… After all, it’s where we go to dream. 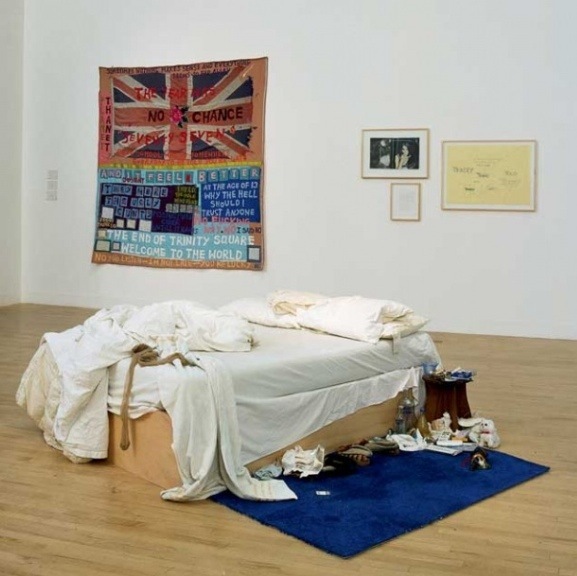 I have always loved the work of Tracey Emin. I love the honesty. I love the openness. I love the beauty. I love the reflections. I love the strength. I love the words. And something about her work speaks to me personally. Like a shared secret. In her work I see the importance of that space. That space between two words; dreams and reality. And I see the possibility of being reborn. I am one of those people who needs sleep. Needs to go to bed early (the earlier the better I say), in my own bed, and sleep through without interruptions to awake feeling refreshed. I’m terrible if I am tired. And maybe that is why. Maybe each day to me is a fresh start, a new life and a chance to get things right. I haven’t slept well this week. Too many things in my head. And, last night, this unfamiliar bed.